Please get in touch by filling out our contact form! Jewish Currents Magazine has been in business since 1946. A progressive, secular Jewish magazine with many great articles, historical news bites and a solid website was in need of a fresh new WordPress theme/website, content cleanup and a way to organize the many decades of historical magazine archives. We recommended a new, custom search engine to categorize, sort and track all articles and magazines written throughout the company’s history. 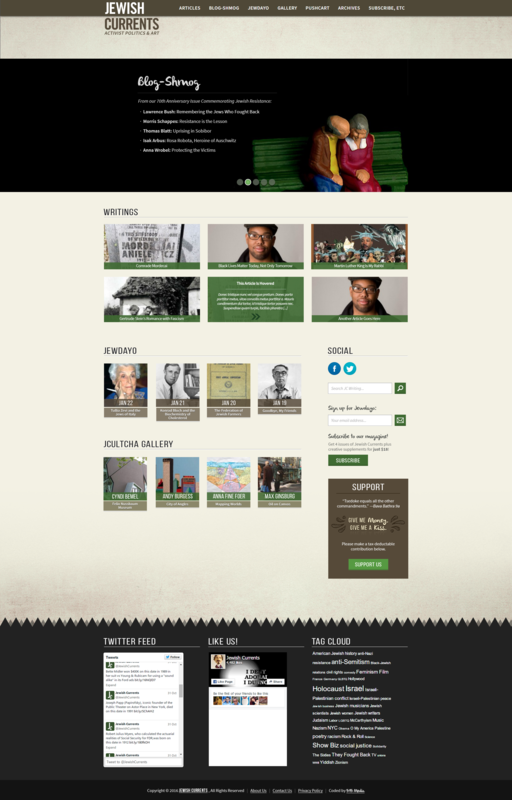 The website was also carrying extra plugins, content and utilizing an older theme structure. This was slowing down the site. Our team recommended a brand new WordPress theme, which we planned to build from the ground-up, and plugin cleanup with a goal to reduce the plugin load on the site and build much of the new functionality into the website. We also recommended subtle graphical enhancements to modernize the website layout and make it much more mobile-friendly. A major increase in website speed, performance and stability was almost immediate. Before we relaunched the site, the Jewish Currents team had many problems with plugins breaking or the site going down entirely. This would happen on an almost monthly basis. Since the redesign this has not happened at all. The new homepage categorization of blog posts and articles, as well as subscription service are all organized better so visitors are clear about where they are browsing. The website article search has performed very well for the team allowing for a great number of ways to track and find articles throughout the history of the magazine. Most of all, the team has been very satisfied with the new back-end of the site, which has allowed them to make updates to the slider, homepage, past issues, and internal pages in a much more effective manner than before.